A recently popularized typology which is moving into the mainstream in personal growth, therapy, spirituality, education and business arenas is the ENNEAGRAM (Any-a-gram). In Greek Ennea means nine and gram means point . The word refers to a circle inscribed by nine points which is used as a symbol to arrange and depict nine personality styles. In its current formulations, the Enneagram brings together insights of perennial wisdom and findings of modern psychology. The Enneagram figure is derived from arithmology while the nine personality styles are validated by experiential observations. The roots of the Enneagram are disputed. Some authors believe they have found variations of the Enneagram symbol in the sacred geometry of the Pythagorians who 4000 years ago were interested in the deeper meaning and significance of numbers. This line of mystical mathematics was passed on through Plato, his disciple Plotinus, and subsequent neo-Platonists. Some believe this tradition found its way into esoteric Judaism through Philo, a Jewish neo-Platonist philosopher, where it later appears as the Tree of Life in the Cabalistic symbolism of ninefoldness. Variations of this symbol also appear in Islamic Sufi traditions, perhaps arriving there through the Arabian philosopher al-Ghazzali. Around the fourteenth century the Naqshbandi Order of Sufism, variously known as the “Brotherhood of the Bees” (because they collected and stored knowledge) and the “Symbolists” (because they taught through symbols) is said to have preserved and passed on the Enneagram symbol. On the frontispiece of a textbook written in the seventeenth century by the Jesuit mathematician and student of arithmology Athanasius Kircher, an Enneagram-like figure appears. More recently George Gurdjieff (1879-1949), a Russian teacher of esoteric knowledge and a contemporary of Freud, used the Enneagram to explain the laws involved in the creation and unfolding of all the aspects of the universe. He alludes to his introduction to the Enneagram in the 1920’s during his visit to the Sufi Sarmouni monastery in Afghanistan. This is the site of the Naqshbandi Order mentioned earlier. Quite appropriately, it is located near a great East-West trade route, where not only goods but also ideas crossed regularly. In yet another culture and part of the globe, the Enneagram was taught by Oscar Ichazo (1976; 1982) as part of his Arica Training in South America. He found that the Enneagram (or Enneagon, as he calls the nine-sided figure) organizes comprehensively the various laws operating in the human person. So while Gurdjieff applied the Enneagram’s process to all of reality, including a rudimentary application to the human person, Ichazo made use of the Enneagram figure and dynamics to explain more fully the functioning of the human psyche. Ichazo claims to have arrived at his understanding of the Enneagram through his own independent studies and research. Claudio Naranjo (1990; 1994), a Chilean psychologist, learned the tradition from Oscar Ichazo and brought the Enneagram further into Western psychology by reframing its concepts in contemporary psychological language. Naranjo elaborated and codified Ichazo’s explorations of the human personality still further. In the early 1970’s Robert Ochs, S.J. and Helen Palmer (1988; 1995) studied the Enneagram system of personality with Naranjo. 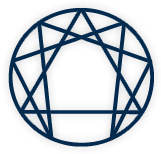 Through Ochs the Enneagram was introduced to various Christian communities, where Jerome Wagner, Maria Beesing, Robert Nogosek, and Patrick O’Leary (1984), Don Riso (1987; 1990), Richard Rohr and Andreas Ebert (1990; 1992), Kathleen Hurley and Ted Donson (1991; 1993), Suzanne Zuercher (1992; 1993), et. al. became acquainted with it. These and other authors promulgated the Enneagram to a broader spiritual, psychological, educational, business and commercial audience. While the trail of the Enneagram grows less distinct before Ichazo, and the exact transmission of the symbol remains unclear, what becomes evident is that the parameters of the person as viewed through the lens of the Enneagram theory have been recognized in some fashion across ages and centuries and across cultures, races, and genders. The Enneagram taps into something universal in the nature and functioning of human beings. The fact that people from such varied places as Africa, Japan, Korea, India, Europe, North and South America, Russia, et. al., can recognize these nine styles in their native cultures speaks to the generalizability of the Enneagram system.